How many have a fully qualified fitter only a call away? If they dont fit their alarms how can they give you accurate advice? Nigel Cook BSc(Hons) GradInstP PGCE, Director, N Cook Security Limited. (See other ad for the non talking version). This is an ideal alarm for those wanting FULL protection on mopeds, Chinese bikes & 2 strokes (or any bike using the Earth out ignition system) , or for those wanting BASIC protection on 4 stroke Japanese bikes. The alarm will operate with just battery connections (though connecting to your indicators and ignition give more features). We also have the "no wire cutting in half" NCS V2 types for Japanese and European 4 stroke bikes, Hyosung, newer Lexmotos's and Keeway's strokes. Random coded remotes, unlike some low price units. Internal anti tamper system - First written about by us and now claimed to to be copied by others. YOU MUST STATE THE MAKE / MODEL / YEAR WHEN ORDERING. If you want this alarm to be bike specific. We are PROFESSIONAL MOTORCYCLE AUTO-ELECTRICIANS and run the WORLDS No1 MOTORBIKE ALARM WEB SITE do a google search for motorbike alarm. We are in position number 1 2. We provide the correct wire diagram for your bike , showing where and which colour wire to connect to. Without this fitting is not straight forward. We have a dedicated team of over 20 alarm fitters from London to Ireland. We support our fellow bikers! 6 All our items are inclusive of VAT. There are no hidden charges. You press "arm" to arm and immobilise. CAN JUST BE CONNECTED TO THE BATTERY ONLY. This will only give you basic protection but gets you up and running very quickly. Warns thieves IN CLEAR ENGLISH RECORDED BY US, NOT A ROBOT! Prevents someone else having your code. Gives you peace of mind. We have fitted these to off-roaders and they still work. Remote / keyless engine start. Allows you to start your ride without using a key! Many Japanese bikes have anti hotwire devices that will need bypassing. This is a simple process which we can help with, unless it is HISS or similar. No false alarms when refueling or cleaning, like those auto arm types! 125dB siren to wake the dead. Lets you go past cars with flashing lights, police style (if that rocks your boat). Can be turned on or off. If someone takes your bike you can kill the engine up to 100 metres away. Your bike is then safe and the thief is ###! We have fitted these to Harleys, most alarms are too bulky or the wrong shape. Hot wire warning / immobilisation. If an object is placed in your ignition or wires cut the alarm will go off and immobilise your bike. Other alarms connect purely to the ignition and are very easily bypassed by motorcycle thieves. 2 stage adjustable shock sensor. Warns potential theives and sets the sensitivity right for your wheels. Tells you and them that your bike is alarmed and ready for business. 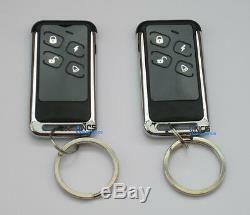 Heavy duty chrome metal edged fobs. Can survive being dropped or stepped on unlike cheap plastic types. Help calling / Panic alarm. Just in case you need it. Flashes lights and immobilises only. We are based in England , not thousands of miles away. Usually 24 Hour P & P.
No hidden charges such as import duty. 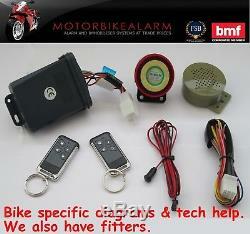 The alarm works with any 12V machine including trikes and ATV's. We have fitters covering the areas below. Note that we only fit our alarms. We have 31 years of motorbike experience. 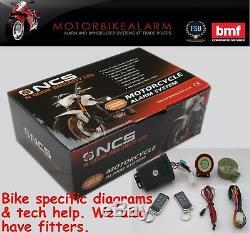 The item "NCS C-11 TALKING MOTORBIKE MOTORCYCLE ALARM & IMMOBILISER REMOTE CONTROL START" is in sale since Monday, January 13, 2014. 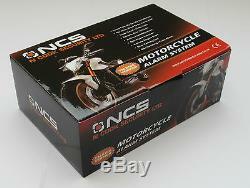 This item is in the category "Vehicle Parts & Accessories\Motorcycle Accessories\Security\Other Security". The seller is "ncooksecurity" and is located in Lancaster, Lancashire. This item can be shipped worldwide.